The recent Super Singer Issue is the most discussed topic in Social Media and fans have expressed their hatred to Vijay tv and some stands by Vijay TV . 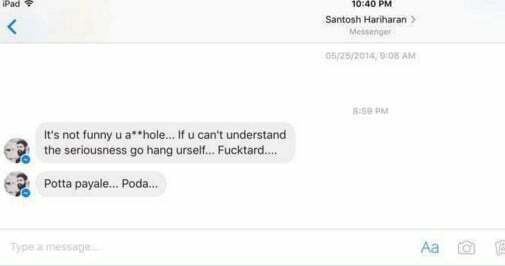 One of the Super singer Santosh Hariharan supported Vijay tv but his views so cheap insulting the public ! Here’s a Meme which Super Singer Season 3 Runner Up SANTOSH HARIHARAN shared against the General Public who were raising their voice against the lame activity done by Vijay TV. Stupid guy..Thinks whoever watches & follow reality shows are jobless..Remember some of us are well employed and earning much much higher than you..Infact you cheap guy from lower midle class family brought your mother in wheel chair just sentiment to get votes from public and you are in this level. DON’T FORGET THAT.. 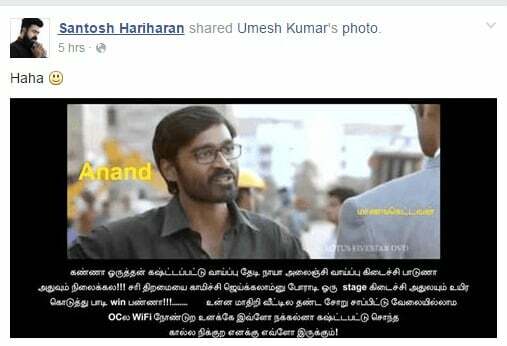 I dont know about these issue, but this post was abuse common peoples.. sonda kala? audience kudukura 120 ticket dan da anda kasu dont forgot that.